Early 20th century gateway; railings Thomas Hadden, 1950. Pair of double wrought-iron gates with square-plan sandstone ashlar gatepiers; wrought-iron railings on chamfered sandstone ashlar base in between. Free classical design with rusticated gatepiers surmounted by broken pediment ends. Bases and band courses to gatepiers. Scrollwork panels and foliage to gates and railings; thistle finials to gates/stanchions. BOUNDARY WALL: various dates, 18th century onwards. Mainly coursed sandstone rubble and low railed coursed sandstone and sandstone rubble walls. Encloses an area of 76 acres. Minor gateway construced in 1912 at S end of St Margaret Street; flanking low coped sandstone walls surmounted by decorative wrought-iron railings, of similar design to those flanking gateway on the Wynd; both railings and gates incorporate wrought-iron scrollwork. Railings enclosing park along Monastery Street are of similar design and date. Cast-iron gate incorporating decorative Art Nouveau metalwork to W of remains of Abbey Palace. Most of the walls were built to enclose the grounds of Pittencrieff House (earlier-mid 17th century onwards). There would appear to have been an entrance to the park on this site since at least the 17th century. One is shown on Wood's Plan. The house and grounds were purchased by Andrew Carnegie in 1902, the latter being opened as a public park the following year. Most of the railings round the park were removed for wartime salvage in 1943. Thomas Hadden of Edinburgh was the blacksmith contracted to supply the replacements in 1950. Hadden was well known for his decorative smithwork, particularly through his collaboration with the architect, Robert Lorimer. Amongst other high-profile work, he was responsible for the screens in Lorimer's Thistle Chapel in St Giles Cathdral in Edinburgh. The park is included in the Inventory of Gardens and Designed Landscapes (see above). 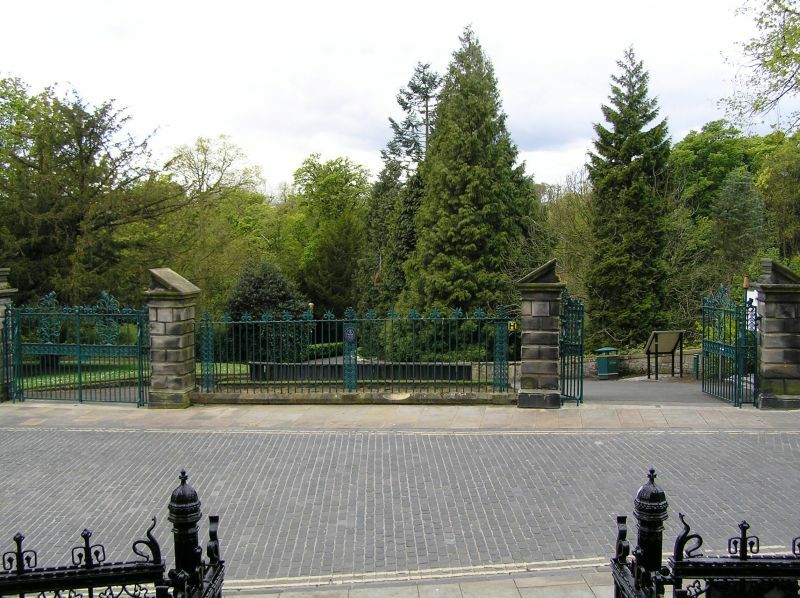 See separate List descriptions for Pittencrieff House, Louise Carnegie Memorial Gateway, Pittencrieff Lodge and Gateway, South East Gateway and West Gateway.